March & April Learning: Future Farmers? 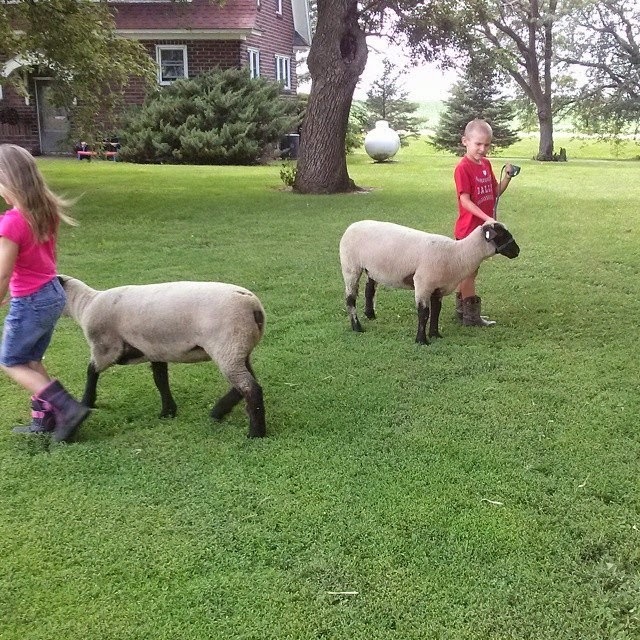 I don't know if my kids will take up any sort of live stock or farming in their adult futures, but this spring R and A are once again taking bottle animal classes so that they can show bottle lambs at the Hamilton County fair. The kids have participated in several county fairs in the past, in multiple counties, and the Hamilton County program is definitely a rockstar program. The kids spend several months in the spring, one Sunday a month, learning about caring for baby animals, showmanship, and doing activities. 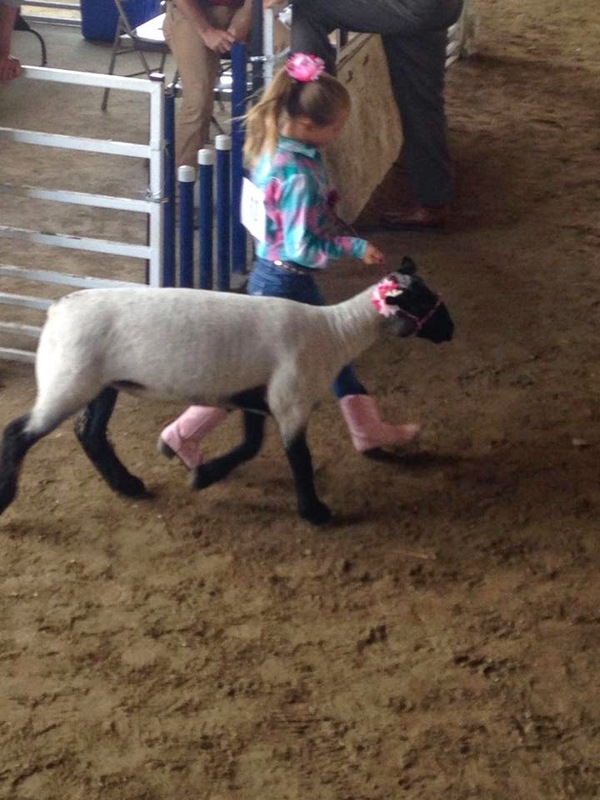 In June they'll bring their animals to the fairgrounds for a practice run, and in July they'll take the lambs to the fairgrounds for the week, practice herdsmanship (keeping the pens clean), and finally participate in the show for an audience and judges. They keep a record book of the experience from year to year, answer questions about their animals in front of the crowd, and lead them around the ring. The physical labor of washing, shearing, and walking the sheep, combined with the literacy skills (spoken and written) involved with documenting and showcasing their projects are life-long skills that I'm so excited to see them applying. Now don't get me wrong, I don't actually touch the animals, but I like to help make their books more interesting with video inserts and QR codes... Oh! And I bought R and her sheep matching hair bows, and bedazzled her halter. Next year R will get to participate in 4H (if she wants), but Hamilton County has definitely done a good job of bringing a small taste of the true 4H process to the bottle animal classes! Did you participate in 4H/FFA programs? Will or do your kids? What are some of your favorite memories? Market 124 - Mom, I painted a cow! Thanks to the recommendation from some fellow North Iowa Bloggers, and a visit the previous weekend with my sister, I chose Market 124 as our field trip and making experiences for the month of March. The staff at Market 124 was super friendly, allowing us to use their upstairs area for painting, which is MUCH more child friendly than the downstairs area. They did not bat an eye at the fact that I brought a 2 year old into their store to paint, but as a mom, you can imagine the tension I felt bringing a toddler into a facility with many, many beautiful (but also breakable) items. Being able to go upstairs with more open space was a lifesaver. The kids each picked a piece to paint, and we were allowed to go at our own pace. After about half an hour of painting E was done, and the other two were able to finish up, so we went downstairs for cupcakes. The cupcakes there, from Grandma Sugar's Cupcakery, are DELICIOUS and at $2 each, way too good a deal to pass up. A stop at Pita Pit topped off our afternoon. Market 124 called yesterday (Thursday) to say our pieces were ready to pick up, so the turn around was about a week. I can't wait to go get the kids' work. E has not stopped telling people that, "I painted a cow. Purple." He was thrilled to be included, and while I was a bit nervous, the washable paint and relaxed atmosphere made for a fun experience for ALL age levels! I drive somewhere around 3000 miles a month for work and activities, and spend 10-15 hours per week with my kids at their events. Car time + wait time = a lot of lazy time! It can be really easy to fall into bad habits when you're on the road and constantly running. But you know what? It's game time, ladies and gentlemen! Time to get back outside, get out the spring and summer clothes, and get back into shape! I have never been a "New Year's Resolution" exerciser, I'm more of a "swim suit season is coming" exerciser. Waiting until February or March to start working out again makes it much less cliche, trust me! Last year (February 2014) I did a 21 Day Fix challenge from Beach Body, which was great. I had amazing results. I bought T25 after hearing amazing reviews. Unfortunately, I have been completely unmotivated in each of my 4 attempts at restarting the programs (1 21DF and 3 T25). I did a lot of walking and running over the summer, fall hit and schedules got crazy; life happened. Winter saw me eating TONS of junk food and gaining a solid 15lb. So fast forward to February 2015, and I'm ready to be back on the wagon. I need to be back on the wagon. I need to model healthy living, I need to feel good about myself, and I need to focus! 1. Make it a public goal - I know my friends are always cheering me on, and I use MapMyRun (they also have this for bike riding and all kinds of activities) to connect with others and share my progress. When I tell other people, I feel a level of accountability to continue. FitBits are also great for this! 2. Apps are your friend - I use MapMyRun, but I also log calories and exercise on MyFitnessPal, which gives me another community of friends to tap into when I'm struggling. No, you don't want to be the person clogging your friends' Facebook feeds with app posts about how sweaty you are, but the communities within the apps are an awesome way to connect with like-minded friends. 3. Make it a family affair! Last night the husband and all three kids joined me down on the track for a quick run. He's training for football, A is starting to train for track season, and R (who is always training) and E enjoyed being part of the fun. Not only are you modeling healthy habits for your kids, but you get in some quality family time. If you're family isn't into joining you, friends are a great substitute. 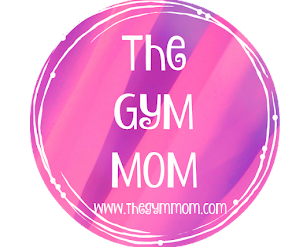 I logged a lot of miles with some amazing gym moms last summer! 4. Set a goal - I haven't done it yet, but I'll soon be looking for a race to put on my calendar to keep myself motivated. It doesn't have to be a race, if you're not a runner, but think about ways that you can keep pushing yourself to stay motivated. 5. Give yourself a break - knowing that you won't be able to stick to any schedule perfectly, but taking advantage of the times when you can will mean less guilt and a greater likelihood of being able to stick to it instead of thinking, "Oh well, I missed my run and ate 3 plates at HuHot today, so I might as well take the whole week off..."
What tips and tricks do you have for staying motivated? What fitness programs have you had the best luck with? As always, I welcome your ideas and input! Last month I had several districts and group who were going to be using LittleBits in different ways, so I asked my kids to help me check them out. That same night, my husband also wanted to check out a marble run activity that his school would be running with kids the following day. It was time to get creative at the Keehn house! A and J set to work engineering a marble track, while R and I worked to talk about and understand circuits with the Little Bits. The kids used the LittleBits to create a joke handshake buzzer - you can see the picture of R's arm rigged up above, and check out the videos of both kids trying it out. Putting the pieces together in different ways allowed the kids to be imaginative, while still having some structure. R later created a flower whose petals rotated with foam and some of the bits. The marble run was a success (though not every time) and we had great conversations around redesign and ideation and prototyping! A was really proud of the work, and even E got in on the fun! They used tape, toilet paper tubes, and a large cardboard background for their run. Free, easy fun with great engineering applications! After spending a day in Mason City with my baby sister, she invited me and the boys to join her at Fuel in Clarion to watch the Iowa State game. Having heard great reviews by multiple people in the last couple weeks, we agreed to come check it out. As you may remember, we're all about "experiences" in my family, and I heard they had some different kinds of coal fire oven pizza that I thought we'd enjoy. A couple blocks north of the "main intersection" in Clarion, we found it easily, and noticed there seemed to be patio seating. On a beautiful day like this that probably would have been my preference, but remember, we were there to watch the Big 12 Championship game (ISU vs KU). The first highlight was not even anything restaurant related, but the clientele! Dinner time on a Saturday night, they had a steady crowd, and as such the 5 of us were going to pull two small high top tables together. If you have ever traveled with a toddler you know this isn't ideal for corralling your kid, but we wanted to watch the game, and we wanted to eat there, so we made it work. Immediately a group of 3 who had a large table offered to move so we could all sit. Now I definitely call that #iowanice! After delightedly discovering that they offered both Coke AND Pepsi products, as well as an extensive line of specialty beers and flavored Moscow Mules, we perused an varied menu of sandwiches and pizza. Wanting a large sampling of the menu, I took charge of ordering! For starters, we needed the beer battered, pretzel crusted cheese balls, and hey, since we're splurging on that diet anyway, let's add the spinach and artichoke dip with pizza chips. J and A chose an all meat pizza, the Carnivore, Michelle opted for a lighter option, the Pesto Chicken, and I went for the "unique" Loaded Spud. The pizzas were excellent. On the Spud I expected something a little more... Rib Crib baked potato? And it was more of a fine dining type, with rosemary (which I obviously should have guessed, from the description on the menu. But you can't go wrong with bacon and sour cream, so I was pleased with my choice. I'll be honest, I didn't try the Carnivore. In my world, an all meat pizza is an all meat pizza, and I wanted to save room, but Je and the boys enjoyed it, for sure. The Chicken Pesto was also very good. The pesto was subtle, but very tasty, and the tomatoes kept it very fresh. The only thing I found strange about the pizza was that they were cut in weird shapes and sizes. That's okay by me - it meant if we wanted to try a small piece, we could! Now you'll notice I skipped the appetizers. That's because I am the kind of girl that can go out and only order appetizers. They're kind of my jam. If people still say that, that is. The cheese balls had a great crunch, and a hint of salt (the pretzel crusted-ness part, I imagine), and the dijon mustard they were served with totally made my night. However, the highlight of the evening. That artichoke dip, though! HO-LY COW. The pizza chips are what you would imagine, bite sized bits of dough, oven roasted. The dip was incredibly creamy and cheesy, and had enough of a kick to make you sit up and take notice. I could live on this dip. I won't, because I don't like to work out enough to make it all balance out, but I will definitely put that on the order every time we go - and we will definitely be back. The atmosphere definitely played to the "Fuel" name, with an old school rustic fuel station kind of vibe, they have entertainment some nights I noticed, and tasting nights for their specialty beers. The service was impeccable. Even though almost all the front tables were full, as well as a couple in back, our server was still incredibly attentive and helpful. And so, the damage: I thought it was really reasonably priced. We ordered 3 small (10") pizzas, 2 appetizers, 2 sodas, 2 domestic beers, and a Mango Mule, and came in under $70 (before tip). We also brought home the equivalent of a full pizza after feeding 3 adults and 2 kids to capacity. Your hands smell when you work with onions. A used a Pampered Chef chopper to chop them up for our cheeseburger casserole, but that didn't keep the smell away completely! It takes a long time to cook 12 chicken breasts! R and I got a cooking and chopping system down, but it took a while! The casseroles took a lot longer to cook than the directions said! We should have started much earlier in the day, this is time consuming (but worth it) and we ran into bedtime problems. The kids had a lot of fun taking charge of a recipe, helping with measurements, and now of course eating our creations! And we've been able to share 4 different casseroles so far with friends! There comes a time in every woman's life where she realizes that she doesn't just have a husband, she has an extra child. Don't get me wrong, my husband is amazingly helpful, probably more than most, but there are times when we have to take care of each other, as well. That being said, I am going to speak about the "generic" husband for this first part, not necessarily my specific husband. I'm sure you could help me add to this list; I'd love to hear more! 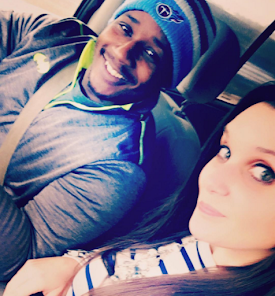 Well ladies and gentlemen, I've added a 4th "child" and his activities to the schedule; husband will be playing football with the Midwest Rampage this spring. He's very excited, and to be honest (don't tell him), I am too. However, I'm less than excited about adding another set of practices, games, and travel into the mix of our already busy lives. Time - this should probably be number one. We have three kids. That in itself is time consuming. But when you have gymnastics 3-4 times per week, t-ball games for at least one kid (maybe two, but that's for another post), work trips, family vacations, gymnastics camp, and now we're adding football? Goodbye summer! Some pretty valid concerns, I think. So it's less than a week until the first practice and I'm ready to say no. I'm not going to sign the permission slip. But then he says, "All I've wanted for the last ten years is the chance to play just one more game." And then images of Michael Jordan and Brett Favre come swirling into your head, and he looks all sad, and you realize that guys look cute in football pants, and you love football, and generally miss it during the spring and summer, so why were you saying no in the first place? Crap. So with a few caveats that 1) he keeps playing softball, 2) I get a t-shirt, and 3) If he gets hurt I will not listen to whining, I signed his permission slip, and jumped on board. 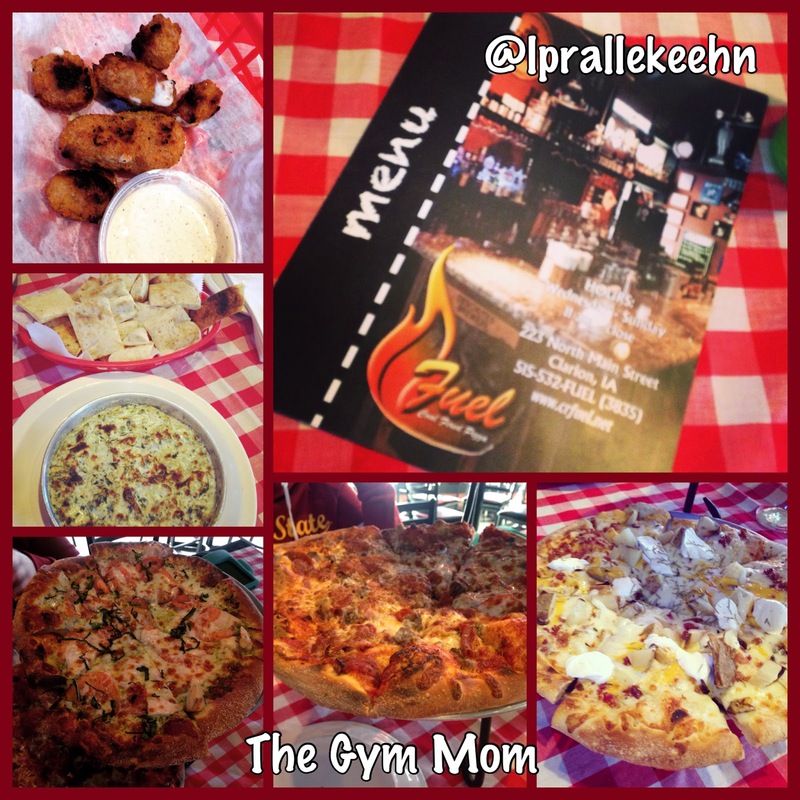 March with The Gym Mom: Sheep, Market 124, and Kitties! After some of our plans fell through this month, it took me a bit to reorganize. Thanks to fellow North Iowa Bloggers though, we have a new plan! Our "learning" this month will be attending the Hamilton County Bottle Animal class, our service project is volunteering at Kitty City Rescue in Stanhope, IA, and our field trip and making activities will be heading to Market 124 in Mason City to paint pottery and enjoy Grandma Sugar's cupcakes! Aaden was scheduled to wrestling in Blue Earth, Minnesota a couple of weekends ago, and he decided he didn't want to go. We had bags packed, the other two kids sent off to grandma's, and at the last minute he changed his mind. As a parent, I had to make a choice at that point. Do I let him "quit" and skip the meet? Or do we make him follow through with his commitment? In this case, the practice season was over for his youth wrestling program, and nobody else from our club was going to the Minnesota meet. We chose it based on how they grouped the wrestlers for brackets. I decided that going up to Minnesota was a long drive for a kid who didn't want to do it. I don't know if he'll be interested again next year, or not. On the flip side, I have Miss RyRy. She has not asked me to quit, but I only give her two chances per year to make a decision about whether she wants to continue. 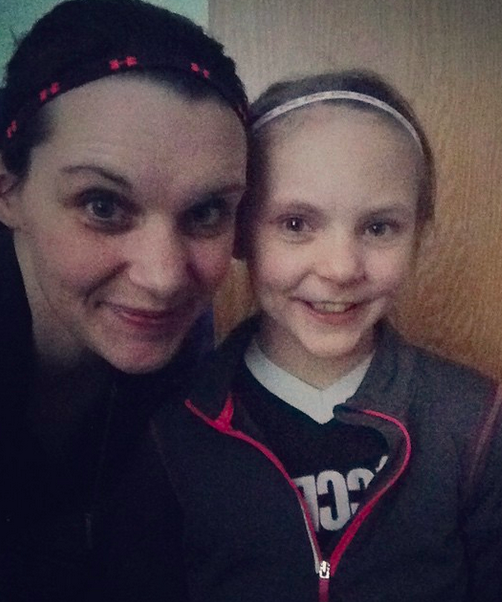 The rest of the time she is committed to the gym and the team. I ask her around Thanksgiving, when we are closing out the season, if she wants to continue into January and do the spring show and go to camp, and again in February-ish before we sign up for camp. Once we start in January she is committed to the Spring Show, and once we sign up for camp, we have a significant financial investment in moving forward. When June hits, we're prepping for meet season, and the cycle starts over again. It's a funny grey area as a parent, deciding when to let your kid off the hook from something they signed up for, and when to make them stick it out even if they aren't happy about it. I remember when R tried soccer at age 4. She asked to go out, but when it came time for practice and games, she cried and cried, and was not a productive team member. We let her be done, but only because they still had enough players to continue without her (not that she was playing, anyway). In rural Iowa there aren't always a lot of substitutes, so I probably wouldn't have the same reaction if A decided he didn't want to play baseball. 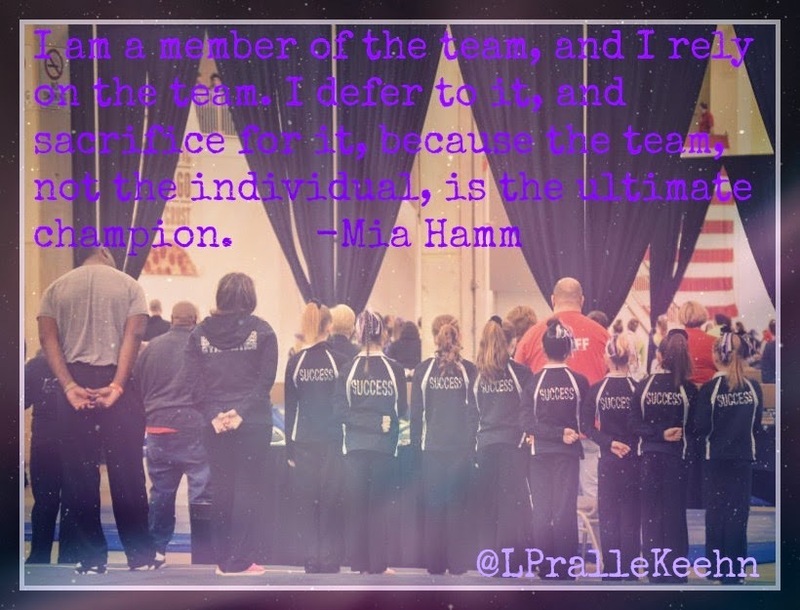 Making a commitment to a team has to mean something, though ultimately you have to decide what is best for your child and who is being hurt along the way. Here's to hoping that we won't have to deal with it much! As always, I'd love advice or input into how you've dealt with similar situations with your own children!